Lecturer in Marketing and Strategy Management, Dr Sujana Adapa is one of 109 recipients across the country to receive the prestigious Citation for Outstanding Contributions to Student Learning award. “I would like to bring in more industry engagement to my teaching, to engage students with the real world,” Ms Adapa said. Ms Adapa will join five other academics from UNE at the Museum of Contemporary Art in Sydney on Friday, for the official NSW awards ceremony. The award acknowledges Ms Adapa’s work in designing and developing experiential learning opportunities with interactive teaching resources in marketing units to encourage student engagement. The Deputy Prime Minister and Member for New England, Barnaby Joyce congratulated the academic on her efforts. “It gives me great pleasure to recognise the significant commitment and achievement of university teachers and professional staff in the UNE,” Mr Joyce said. “Improving the student learning experience is what these Citations are all about. "The Citation award recognises a diverse range of contributions and are evidence of the innovative and dedicated work of our university teachers," he said. The Minister for Education and Training, Simon Birmingham also praised the recipients on their commitment and dedication to teaching. “Excellent teachers and their work deserve celebration to ensure even more Australians can benefit from the lessons they’ve learned,” Mr Birmingham said. UNE will join 36 universities across the country to have academic staff recognised through the Coalition Government's 2016 Australian Awards for University Teaching program. Kay Hempsall has been recognised in the category of Citation for Outstanding Contribution to Student Learning. Rene Villano is the recipient of the Award for Teaching Excellence. On Friday 18th September, 2015 Dr Subba Reddy Yarram, Senior Lecturer, Accounting and Finance Discipline, was recognised as one of Australia’s finest University lecturers at the 2015 Australian Awards for University Teaching. 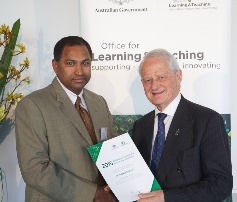 Subba Yarram received a Citation for an Outstanding Contribution to Student Learning from the Hon Philip Ruddock MP. Subba Yarram’s Citation was for developing interactive online resources and formative assessments that support students with diverse prior knowledge and experiences to acquire problem-solving skills in corporate finance. Kay Hempsall was identified as having demonstrated excellence in the category ‘Approaches to teaching and support of learning that influence, motivate and inspire students to learn’. Kay's Application demonstrated how she has influenced student learning, engagement and overall experience in MM105. Kay’s excellent teaching has been recognised at both the University level and by her colleagues within the school and, most importantly by her students. 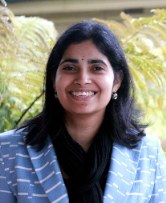 Dr Sujana Adapa, Senior Lecturer in Management (Strategy & Marketing) has won the Best Reviewer award in the Entrepreneurship, Start-Ups & Small Business Stream in the 29th Annual Conference of the Australian and New Zealand Academy of Management (ANZAM), 2015 held on the 2nd-4th December in Queenstown, New Zealand. Professor John Rice, won a best conference paper award for his research looking at the rollout of the Balanced Scorecard (BSC) in a Thai hotel: Gurd, B., Rice, J. & Hyde, P. (2015). Synergies and dissonance between culture and performance measurement – a study within a Thai hotel. The research noted that generalising about cultures within nations is generally not helpful, and that Thai managers differed significantly in their acceptance of US style performance management and the impact that the introduction of the BSC had on their perceptions of performance. Dr Leopold Bayerlein and Naomi McGrath (jointly) and Brent Gregory were winners of Innovation Awards at the 2015 ASCILITE Conference. Leo and Naomi’s award recognised “Balancing Life - A Virtual Internship for Accounting Education” and Brent’s award was for his Accounting unit: “Instant Feedback Accounting Practice Set”. These awards are “in recognition of outstanding innovation in the development of a major professional development initiative which promotes the exemplary and research informed use of technologies for teaching and learning in tertiary sector”. Sue Whale, Naomi McGrath and Tim Cluley were finalists in the LearnX Impact Award – Best Talent – Learning Team. The LearnX Awards aim to acknowledge the importance of learning and development and recognise the impact that talented learning professionals can have on organisational capability. On 27th November, 2015 Dr Ian Tiley, Adjunct Research Fellow at UNE Business School and an Associate at the Institute for Rural Futures was conferred the 'Volunteer Lifeblood' Award at the Northern Rivers (NSW) 2015 Community Sector Awards, sponsored by Summerland Credit Union and the Northern Rivers Social Development Council. The award for being "the lifeblood of the community sector" was one of seven conferred on the night and recognised his ongoing contribution as an Indigenous Community Volunteer to five NSW Aboriginal communities at Wellington, Dubbo, Dorrigo, Casino and Lismore.